Longshaft map varient with AI Bots - Marines and Spartans (Blue) vs. Covenant Forces (Red). This is an epic air and land battle between the Covenant and UNSC forces for the Longshaft enclave on Halo, with AI driven land and air vehicles. This is the same mod as Dogs_of_War, but with a night sky. 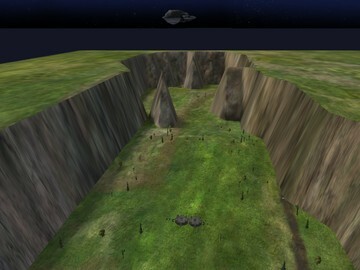 Many modifications have been made to the original map for scenery, weapons and vehicles. There are approximately 90+ AI actors involved in this Mod. An forward operating Marine base was receiving coded transmissions concerning secret Covenant plans for a major attack on UNSC forces. Unfortunately, the Marine intelligence officer and guards manning the base and deciphering the transmissions were captured and interrogated by the Covenant forces. The brave officer never divulged what the UNSC knew of the Covenant plans, however, before he was eventually killed he taunted his interrogators with the fact that they would never be able to remove the encryption/decryption computer without it self-destructing in the process. The Covenant have therefore decided to seize control of the base, and after securing it, bring in their own intelligence expert to decypher exactly what transmissions have been intercepted. Meanwhile, the crew of the UNSC Frigate Aegis Fate have determined the coordinates for local teleporters at the base, and have been able to teleport from orbit a couple of brave Marines at a time to try and defend the base until Marine and Spartan reinforcements can arrive to secure it against the Covenant attack. Marines and Spartans (Blue Team) have dropshipped down to set up an operating base at one end of the valley for staging their attack, and Covenant forces (Red Team) have done the same at the opposite end of the valley. One UNSC dropship that was transporting a portable nuke for destroying the Covenant base was lost during descent. Covenant will begin their seige in Fr-Ghosts, Wraiths, and on foot against the two solitary Marines manning turret guns at the base. An Elite piloted Banshee provides air support from the mountain ridge beyond the red team base. 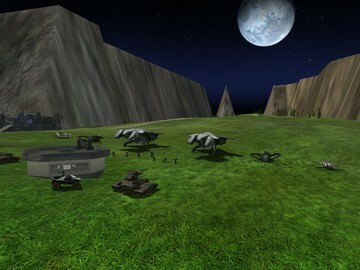 Marines rush to the defense in Warthogs and on foot, while a Spartan piloted Jet provides air support from the mountain ridge located beyond the blue team base. Elites reinforcements with plasma rifles await transport in Phantoms, while Spartans with Famas rifles await transport in Pelicans and Kestrels. The reinforcements will deploy upon arrival in a landing zone by just hitting the "Q-key" (flashlight), and will also unload from Warthogs and Scorpions in like manner. You will typically have to hit the "Q-key" in order to get troops to load into the vehicle. After a few minutes of awaiting your transportation, these reinforcements will just decide to proceed on foot. In a short period of time, a new group of reinforcements will spawn in their place. Air raid sirens will sound when pilots are en route for an air strike, and proximity alarms will also sound when entering the perimeter of the enemy base. Nuclear surface-to-surface missile launchers are located high up on these same ridge lines a total of three missiles each, so use wisely. This was a custom vehicle that does not drive very easily, so just steer it into position for aiming your missile. When you teleport near a nuclear missile launcher, a missile warning siren will sound. Problems do occur for clients when trying to transport troops and hitting the Q-key "flashlight" to unload vehicles, with your player for some reason bouncing all about the map. In lieu of hitting the Q-key, the client might try using Dev Mode Command "ai_exit_vehicle spartanassault" or "ai_exit_vehicle eliteassault" to empty the vehicle. This mod is designed primarily for solo play, where you can play on either team. There are just too many AI running, driving and flying around for it to work very well as a multiplayer game, though it has been tested and works on LAN, with some video setting adjustments. Problems do occur for clients when trying to transport troops and hitting the "Q-key" to unload vehicles, with your player for some reason bouncing all about the map. This is a very intense AI battle, with multiple AI driven vehicles in operation at one time, so it takes a lot of processing power. Unless you have a fairly high-end PC, When playing on LAN (maybe internet), there will be quite a bit of Lag on the client PC. Depending on your specs, if you tone down the graphics to 800x600 or 640x480, select no shadows, no spectral, low particles, textures, etc. it will improve performance. The map mod works very well on Dual-Core desktops and laptops with Dedicated 256 MB and greater graphics cards. ALWAYS REMEMBER, No AI Characters Will Sync in HALO CE Multiplayer. Unzip the folder to your desktop, then move the dogs_of_war.map into your Halo Custom Edition\maps directory, or unzip it directly to the maps directory.